I love my bookshelf loudspeakers. Yet every time I hear my music on systems with full-range or -approaching speakers, I am confronted with what small monitors cannot reproduce. I am not an audiophile who only listens to pristine recordings of young girls breathlessly suggesting to come hither. I like heavy metal too. Unfortunately, while the Vienna Acoustics Haydn loudspeakers are perfectly capable of rocking out, they do not reproduce the controlled distortion lo -frequency articulations (what some would hastily call noise) that are integral to a truly fine heavy metal recording. To put is simply, I want more. For five years, I have been window-shopping for subwoofers and a friend even lent me one he built himself. A 2.1 music system is not as menacing as some might believe. I also asked friends for opinions, researched the web and finally requested a sample to use in my system: one of the new REL R-series subwoofers. I am a technical writer by day so I read through REL's setup instructions. They were decently written and I was able to follow them, however, reformatting the procedures into a step-by-step process would help purchasers get the most out of the procedure. I was not happy with my first attempt at placing the sub so I called my friend David. He has extensive experience with subwoofers. He has built subwoofers for his car and his home. When David saw the instructions, he was shocked because the procedures said to place the sub in a corner to properly load the room. Apparently, he had other theories on subwoofer placement. David brought his son along to hang out. After a dinner of Mediterranean kebobs and rice, we started listening, positioning, and adjusting. This lasted two hours and resulted in a relatively 'invisible' sub that integrated reasonably well with my monitors. The sub was now repositioned somewhat in the middle of the listening area, in front of the speakers and about 2 feet away from the side wall. Then we did what guys do - called over our friend Adam, who has excellent hearing. We drank beer and listened to music. The sound was much improved from where I first placed the sub and David knew how to dial-in the sound with proper adjustment of phase, crossover and volume. I still had an appointment with a Sumiko Audio representative with a lot of experience setting up REL subwoofers but now I had enough of an idea to compare the different setups. Besides, I could always move the sub back in front if I did not care for the sound. How was that for a passive solution? When Bill Peugh of Sumiko Audio/REL arrived, he was polite and maintained his composure despite my ignorance in matters of subbing. Yes, my friend recommended moving the sub away from the corner for the best sound. Yes, I thought my loudspeaker sounded best in their current position. No, I hadn't filled the speaker stands with sand yet (an audiophile no-no of course). Bill also asked some important questions about what I had stored in the attic on either side of my listening room. Bill considered the entire listening room and explained how the arrangement of all the junk in my attic could influence the sound. He also agreed that most of the bass in my listening room was leaking to the garage below and carefully walked me through the procedure of positioning my loudspeakers to properly load the room for the best sound. and recant anything that might please the Inquisition just to not hear that horrible track again. Bill had to remind me a couple of times that it was better to ruin only one song during this process. When he was finished, the Haydns did indeed sound better, with sharply focused imaging, more authority in the midrange and improved bass response. Then he was on to position the R305 using the famous Sneakers soundtrack on endless repeat. After 30 minutes of a repetitive low-frequency drumming noise, we were finally satisfied with LF extension and bass detail. I could hear the mallet heads striking my mullet mutton head - or something like that. It's in the recording. I know because I listened to it until the stupid juice dribbled down my chin. Bill removed his discs of torture from my CD player and we finally played some real music. The passionately low voice of Maria Bethania [DRG 31616 2006] was beautifully positioned at standing height between the speakers. She invoked a storm of Brazilian percussion to wash away all traces of audio torture. I was converted and even considered asking if I could buy an indulgence. What Bill was able to achieve that I could not (even with help from friends and beer) resulted in an epiphany. Instead of engaging in pagan hymns to the monolith, the monolith (or at least two small beech-veneered ones) now sing for me. Perhaps prophets simply help people to feel the bass of goodness in their lives. Years ago in an Editorial, Srajan described the cost-effectiveness of paying someone to ensure that your music system is configured correctly for your listening space. My experience validates this. If you want your system to sound its best, call the professionals. Bill is still holding onto his copies of the Jennifer Warnes and Sneakers CDs so I won't dare pass on his cell number lest he return. After two of us setting up the subwoofer for the second time, I felt like women must feel after subjecting themselves to a free makeover at the mall. They can't tell if their beauty is actually enhanced or if they are simply wearing too much makeup. I asked for extra time to complete this review so I could truly understand how the difference made by the subwoofer compared with the difference made when Bill repositioned my speakers. Repositioning the Haydns was an obvious improvement but not near as drastic as hearing a different set of speakers. The Haydns simply sounded the best I ever heard them sound in my listening room. What was this review about again? The REL R305 is a very dapper subwoofer and did not 'dress down' my music system. It even added a touch of class to my otherwise bland listening space. For some audio fanatics, appearances don't matter but it is always nice when the audio equipment can look as nice as the music sounds. The cabinet is a piano-black lacquer finish over ¾" MDF with internal bracing and hand-sealed joints. The subwoofer cabinet is very solid and inert. There are stylish ridges in each of the three sides that surprisingly matched the Foster and Lowell loudspeaker stands I have been using for years. 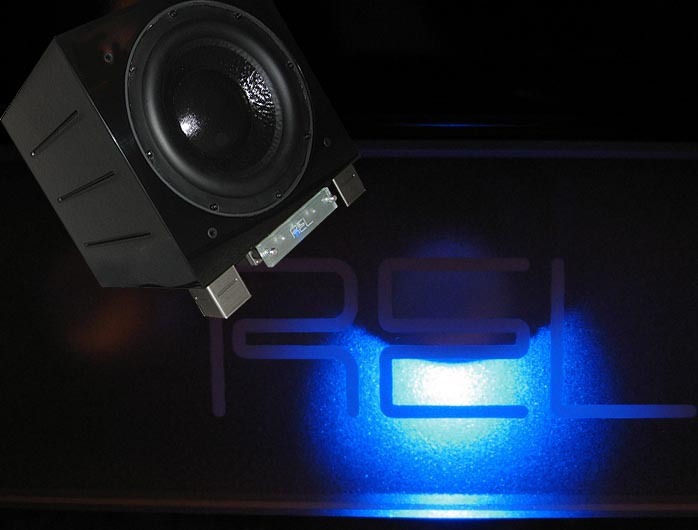 The blue LED behind the frosted glass panel with the REL logo is a nice touch and does not visually scream like the raw LEDs on most audio components. The driver cone is made of a very durable pulp material similar to the Britannia line of REL subwoofers. The driver surface is wrinkled like a cotton shirt just out of the dryer but the cone shape is rigid of course. Accessing the subwoofer controls is as easy as turning the two thumb screws on the frosted glass panel. Controls include a volume control to set the Hi/Lo input, a volume control to set the .1/LFE input, a variable crossover control and a phase switch. What more do you want? This is a subwoofer, not a space shuttle. The power switch is on the rear panel, just underneath the fused IEC socket . It didn't bother me to have to reach beneath the power cable to switch on the sub. My amplifier is more annoying in that regard. The rear panel also has a high level Neutrik Speakon socket, a low level phono input and a .1/LFE input. The last two items were not used for this review. 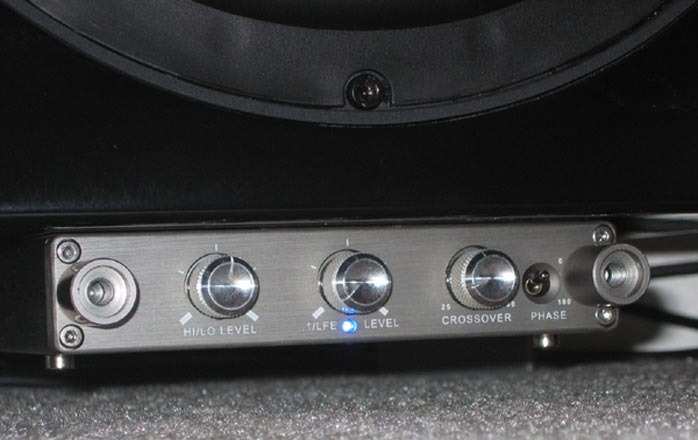 The low-level phono input can be used for people who use active loudspeakers and can't use the high-level connector. The.1/LFE input can be used to connect the sub to a multi-channel receiver. 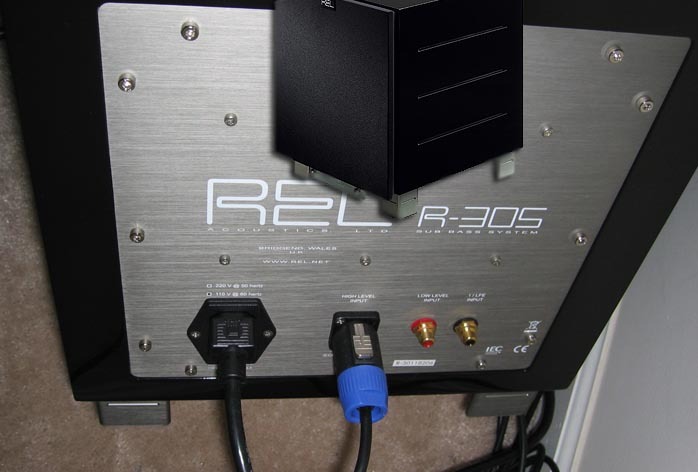 For best sound, REL recommends connecting the R305 with the high-level cable to the speaker output terminals on your amplifier. This draws a negligible amount of power from the amp and sends the signal to the subwoofer amplifier. All REL subwoofers have a 'Set Safe' feature which provides soft clipping to prevent the woofer from being overdriven. 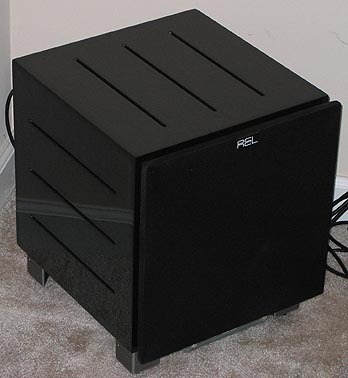 The REL subwoofer is also power conscious. When no signal is received, the subwoofer goes into "power starvation" mode and only draws 4 watts. When a signal is detected, the subwoofer amp is still on so the REL subwoofer is always ready for sudden transient signals. The R-series subwoofers are the first REL subs to use digital switching amplifiers instead of their standard MOSFET-driven, Class A/B amps. The R205 has a 10-inch driver and 200 watts of power, the R505 grows to 12es and 500 watts of power. My R305 loaner is the middle unit and powers a 10-inch driver with 300 watts. The R305 ran cool and never seemed to compress to move the massive driver. When I removed the grille and played "Deep Voices" on my favorite whale song CD, I was treated to a visual dance. The R305 can really flex some muscle for monster excursions. I also played a hard house version a friend burned for me of Offenbach's Can-can music. The 10" driver could not move enough air to fully reproduce what must be extremely low frequency sounds on the hard house CD but it was fun to watch it try! While listening to my music system with the sub on and then off, I kept thinking of the Dutch door. It is the style of door split in the middle so the bottom can be closed to keep the goats and sheep from wandering into your house while you enjoy the fresh outside air. Unfortunately, the outside air where I live is a little too close to the highway and a chemical plant but you get the idea. The REL R305 gave me the whole view of the outside world (at least as much as what is captured on my recordings). The R305 made it clear to me how much music I had given up for the limited frequency response of bookshelf speakers, keeping the lower half of the Dutch door closed. With the R305, the fast was over so I dug out my heaviest music and made a feast - early Black Sabbath, Korn, Soulfly, Opeth, Rammstein, Heaven Shall Burn, Dream Theater, Rush, Meat Beat Manifesto, Bad Company (a jungle act by the same name), Rimsky-Korsakov, Borodin, Beethoven, Mahler, Saint-Saëns and (heavily transcribed) Bach. All of this music sounded more powerful and reached lower than ever before. Heavy metal guitars snarled at me and Opeth's death metal growling came from somewhere in the pit of the singer's stomach [Ghost Reveries, Roadrunner 618123 2005]. My Haydns do not even attempt to recreate the lowest frequencies sampled by Meat Beat Manifesto [RUOK 33722 2002], but the R305 did! The floor seemed to throb under the musical pressure. I even had fun playing my daughter's Shark Tale soundtrack [Dreamworks 346812 2004]. Ziggy Marley's faithful recreation of "Three Little Birds" is as joyous and fun as his father's original version. With the R305, the bass hit much harder than Bob could ever have imagined. In fact, the R305 gave any rhythm section more of the visceral excitement of live rock music where you can feel the music in the lower part of your chest. Kick drums on the Opeth CD kicked hard. Symphonic music extended into subterranean caves of bass and I could hear just how deep a concert organ plumbs. This was evident when playing an old recording of Saint-Saëns that I assumed was a little lean in the bass [EMI 585186 2003]. Surprise, surprise! Low organ notes, whether sampled or live, were weighty and substantial, not airy or thin. The bass had meat. Because of this, the power of a full chorus and orchestra on Mahler's 8th Symphony [Naxos 8550533 2006] packed an extra wallop with the R305! But it didn't end there. The R305 was not just about adding power and depth to the music. Intimate chamber music was rendered with more feeling. Schubert's Trout Quintet [Virgin 45563 2005] sounded more realistic with improved hall ambience and more air on the strings. The extended low frequencies gave each instrument greater presence so I could audibly feel each musician playing in my listening room. Listening to a violin concerto by Vasks [Hyperion 67496 2005] proved that the R305 was a natural addition to my stereo, not a bass-additive. If you are only used to hearing the Academy of St. Martins in the Fields as conducted by Sir Neville Marriner; then this disc will be a real ear opener! In the second movement, strings on the double basses are plucked. I could hear this with the Haydns even though I knew the instruments don't have the same tonal depth as they do in a live concert. With the R305, I heard the whole plucked chicken and realized that I didn't have to imagine the frequencies I was missing because the sub-bass system actually reproduced them in my listening room. At one point, the orchestral strings swoop and soar like bats in a cave. The R305 made the experience more threatening. The sense of the acoustic space of the recording venue was enhanced and I felt like I was listening to a live event more than just a studio recording. Could I have this experience with another sub? How about one with a less attractive finish and a lower price? I do not have anything for comparison right now. My experience with the R305 was so good, its appearance so attractive, the controls so easy to operate that I really do not want to let this subwoofer out of my listening room. Bill Peugh mentioned that the R305 was demoed successfully at an audio show with the latest versions of the Haydn loudspeakers. It certainly was a success in my house! Even though the R305 is a very fine subwoofer, there are some compromises to consider. The R305 is not as feature-laden as some other more expensive subwoofers. It does not have a remote control or digital presets that can automatically readjust the response curve for different types of music. Also, if you feel that bigger must be better, then perhaps the REL R305 is not for you. The R305 only has a 10" driver which will not move as much air as 12", 15" or 18" drivers. If your room is significantly larger, the R505 with a 12" driver might be a better choice, or an even larger and more powerful REL sub-bass system. I could always hear where the R305 was located in my listening room but I really didn't mind because it did not compromise the music experience. The R305 was a significant enhancement and filled my entire listening room with bass - appropriately, as natural part of the musical experience. I’ve been listening to music over monitors for many years now. While I have heard and reviewed some floorstanding loudspeakers, the tiny Haydns have remained my reference since I started reviewing. This is not to say that these speakers are better than anything else out there. Rather, they have made it very easy for me to examine all other components I have added to and removed from my music system. I love the imaging and air that a pair of well-designed monitor loudspeakers can provide. These qualities can be compromised in floorstanding designs where additional drivers and complexity can hamper the music in favor of lower frequencies or 'room-filling' sound. The best floorstanding loudspeakers I have heard are unfortunately out of reach of my stereo budget. Eno once suggested placing a third loudspeaker behind the listener when listening to his ambient recordings. I always thought this made more sense than 4 or 5 speakers. With the REL R305, my music system now offered greater ambience, without having to subject my skull to the psycho-acoustic entrapment of a surround system. My bass-head friend liked the REL and suggested that I needed two subwoofers of even greater size to enhance that illusion - but then would't floorstanders be more practical? [Not. They'd likely be passive to lack the room tuning bass adjustments of separate active subwoofers - Ed.] Floor space is at a premium in most homes and mine is no exception. 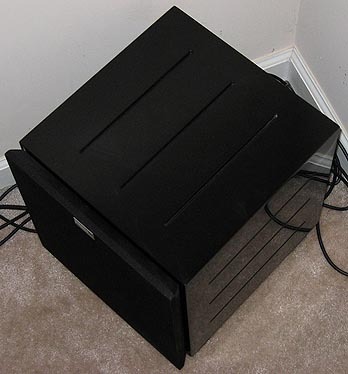 Some subwoofer enclosures are too large and visually unappealing. My wife was shocked at first by the REL's appearance. She didn't think it was unattractive at all, just imposing. That was when it was placed two feet out into the room. It was even worse when my buddy moved it out into the middle of the room in front of the speakers. After Bill Peugh's visit when the little black box was finally nestled into the front left-hand corner, my wife approved and even brought a few of her own heavy CDs to listen. The R305 looks sharp, sounds fantastic and is very easy to operate. Just give yourself time for set up or ask your local dealer (where you bought the sub) to help position it properly. Save the beer until after the sub is locked in position. Then put on Bruckner's 8th Symphony and remember to trust your ears. If you are interested in a modestly sized subwoofer that will integrate delightfully with a music system, I sincerely urge you to arrange an in-home demonstration of the REL R305. A subwoofer like the REL R305 is an essential upgrade to a modest two-channel music system.